Why Distribute The Great Controversy? "God will soon do great things for us if we lie humble and believing at His feet. . More than one thousand will soon be converted in one day, most of whom will trace their first convictions to the reading of our publications." Review. November 10. 1885 [Colporteur Ministry 151]. "If there is one work more important than another, it is that of getting our publications before the public, thus leading them to search the Scriptures. Missionary work introducing our publications into families, conversing, and praying with and for them is a good work. " Colporteur Ministry. 80. "Let every Seventh-day Adventist ask himself. 'What can I do to proclaim the third angel's message?' Christ came to this world to give this message to His servant to give to the churches. It is to be proclaimed to every nation, kindred, tongue, and people. How are we to give it? The distribution of our literature is one means by which the message is to be proclaimed. Let every believer scatter broadcast tracts and leaflets and books containing the message for this time. Colporteurs are needed who will go forth to circulate our publications everywhere." Southern Watchman, January 5, 1904. "The book work should be the means of quickly giving the sacred light of present truth to the world. The publications that come forth, from our presses today are to be of such a character as to strengthen every pin and pillar of the faith that was established by the 'Word of God and by the revelations of His Spirit." 9 Testimonies. "In reviewing our past history, having traveled over every step of advance to our present standing. I can say, Praise God! As I see what the Lord has wrought, I am filled with astonishment, and with confidence in Christ as leader. We have nothing to fear for the future, except as we shall forget the way the Lord has led us, and His teaching in our past history." Publishing Ministry, 25. "Let not the canvassing work be left to languish. Let the books containing the light on present truth be placed before as many as possible. The presidents of our conferences, and others in responsible positions, have a duty to do in this matter. Southern Watchman, April 25. 1905. 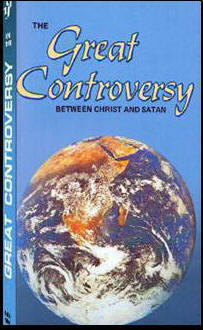 "The world is to receive the light of truth through an evangelizing ministry of the Word in our books and periodicals. Our publications are to show that the end of all things is at hand. Christian Service. 146. "God calls upon His people to act like living men, and not be indolent, sluggish, and indifferent. We must carry the publications to the people and urge them to accept." Southern Watchman. April 25. 1905. "Our publications are now sowing the gospel seed, and are instrumental in bringing as many souls to Christ as the preached Word. Whole churches have been raised up as the result of their circulation. In this work every disciple of Christ can act a part. Review. June 10. 1880. "A messenger from heaven stood in our midst, and he spoke words of warning and instruction. He made us clearly understand that the gospel of the kingdom is the message for which the world is perishing, and that this message, as contained in our publications already in print and those yet to be issued, should be circulated among the people who are nigh and afar off." 9 Testimonies. 67. "Few have a correct idea of what the distribution of papers and tracts is doing." Publishing Ministry. 398. "Satan is busy in this department of his work, scattering literature which is debasing the morals and poisoning the minds of the young. Infidel publications are scattered broadcast throughout the land. Why should not every member of the church be as deeply interested in sending forth publications that will elevate the minds of the people and bring the truth directly before them? These papers and tracts are for the light of the world, and have often been instrumental in converting souls." Review, June 10, 1880. "The night of trial is nearly spent. Satan is bringing in his masterly power because he knoweth that his time is short. The chastisement of God is upon the world, to call all who know the truth to hide in the cleft of the Rock, and view the glory of God. The truth must not be muffed now. Plain statements must be made. Unvarnished truth must be spoken, in leaflets and pamphlets, and these must be scattered like the leaves of autumn." 9 Testimonies, 230-231. "Many of God's people are to go forth with our publications into places where the third angel's message has never been proclaimed. Our books are to be published in many different languages. With these books, humble, faithful men are to go out as colporteur-evangelists, bearing the truth to those who would otherwise never be enlightened." 9 Testimonies. 33-34. "From city to city, from country to country, they are to carry the publications containing the promise of the Saviour's soon coming. 9 Testimonies, 34.